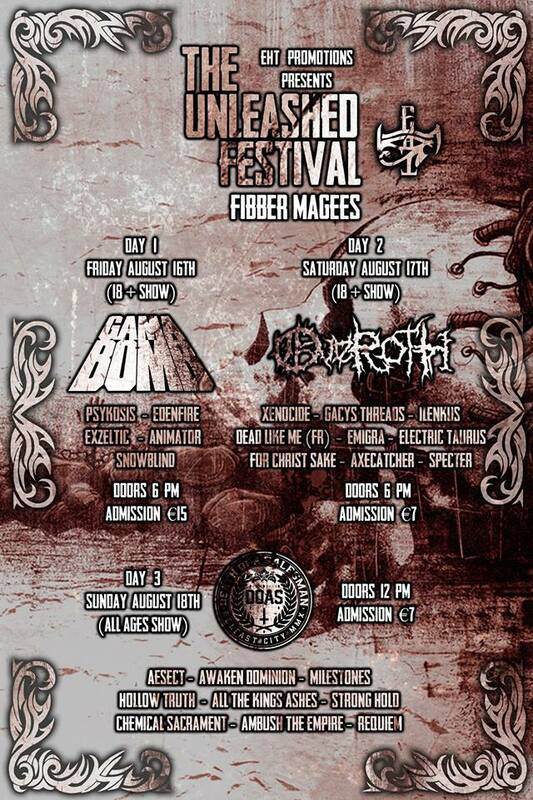 Metal heads of Dublin; prepare to get excited as EHT are bringing us three days of thrash and death metal this summer. Fibber MaGees will host the event that’ll see thrash metallers Gama Bomb and the mighty Overoth headline. There will also be an under 18’s day of bands for those that can’t make the first two nights. Line-up’s for the three shows are available below and there are just a few acts left to confirm. Tickets can be bought individually or a two day pass can currently be purchased for E20. A three day pass is currently being considered and TT will let you know when details have been announced. This entry was posted on June 30, 2013 at 4:20 pm and is filed under Gig Listing, Music, New Music with tags Aesect, Animator, Edenfire, EHT, Exzeltic, Fibber Magees, Gama Bomb, Overoth, Pskyosis, The Unleashed Festival, Xenocide. You can follow any responses to this entry through the RSS 2.0 feed. You can leave a response, or trackback from your own site.